A photo from the March on Washington, Aug. 28, 1963. It is one of about 25,000 images from photographer John Kouns' collection, now part of CSUN's Tom & Ethel Bradley Center. Photo by John Kouns. 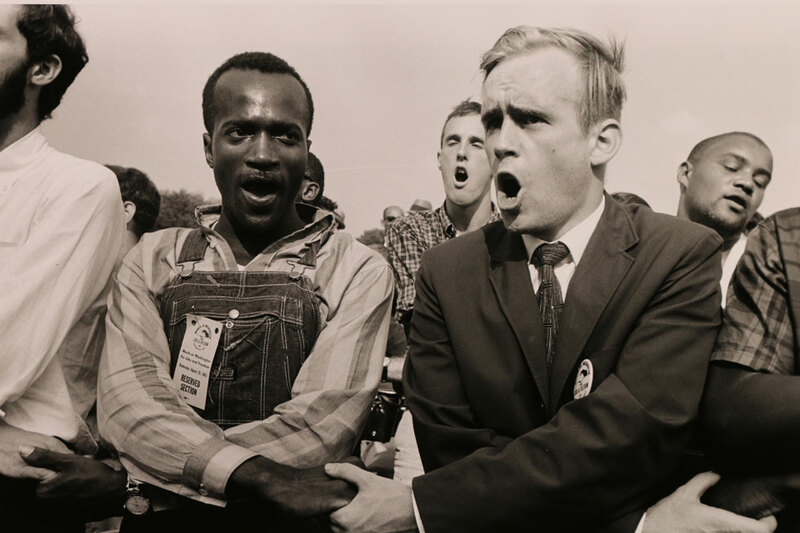 The image of two men holding hands while signing "We Shall Overcom," at a rally was taken by John Kouns at the March on Washington on Aug. 28, 1963. The photo is now part of the Tom & Ethel Bradley Center's collection. 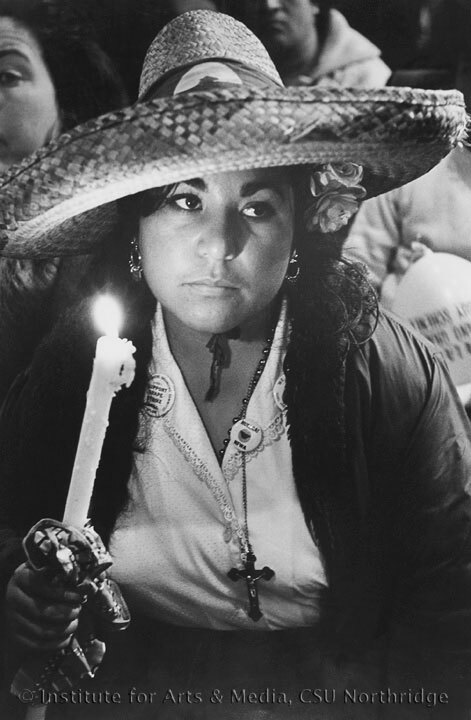 The photo was taken by John Kouns during the United Farm Workers' march on Sacramento in spring of 1966. The image is now part of the Tom & Ethel Bradley Center's collection. Taken in Delano, Calif., in 1965 by John Kouns, this photo is of a man thanking the United Farm Workers for fixing his car. The photo is now part of the Tom & Ethel Bradley Center's collection. 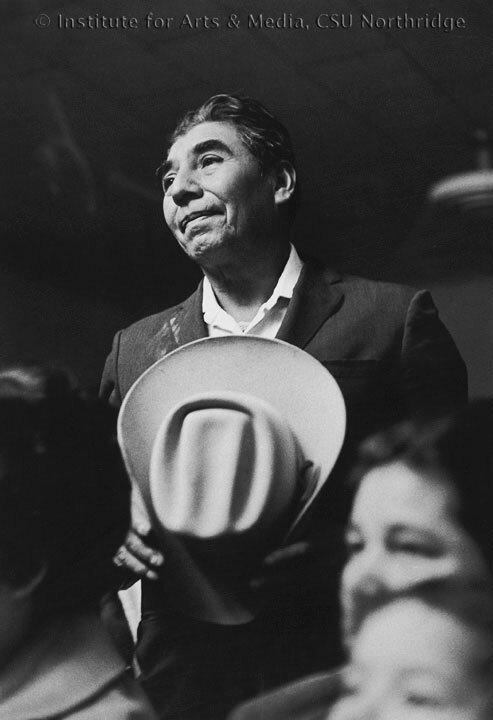 This photo was taken by John Kouns at a United Farm Workers event in Modesto, Calif., in 1966. It is now part of the Tom & Ethel Bradley Center's collection. His images document history as it is being made. They portray people struggling for workers’ rights, for civil rights and for social justice. They portray people who hoped for a better future for their country. American photographer John Kouns spent years documenting two of the most important social movements of the 1960s and 1970s in America — the civil rights struggle in the South and the workers’ and civil rights struggle of the United Farm Workers in California. A self-described “concerned photographer,” Kouns’ images open an intimate window to the work of the anonymous history makers behind these movements. California State University, Northridge’s Tom & Ethel Bradley Center recently has received the first installment of about 25,000 images from Kouns’ photographic collection, additions to the center’s own expanding collection of photographs about ethnic minority communities in California and the nation. Journalism professor José Luis Benavides agreed, adding that Kouns’ work is a significant new addition to the center’s collection. Kouns talked about his work in an oral history of his career recorded by former CSUN graduate student James Moore in 2005. Born in Alameda, Calif., on Sept. 21, 1929, John Alexander Kouns grew up in San Jose. A high school teacher introduced him to Richard Wright’s novel “Native Son,” which he said shaped his perspective on race in America. “It affected me tremendously,” he told Moore. After finishing the book, he asked his teacher what he could do. “John,” the teacher is reported to have told him, “what you should do is belong to the NAACP [National Association for the Advancement of Colored People].” He joined the civil rights organization at the age of 15. In the late 1950s, Kouns studied at the New York Institute of Photography, where he met and was inspired by W. Eugene “Gene” Smith, an American photojournalist renowned for the dedication he devoted to his projects and his uncompromising professional and ethical standards. After working as a news photographer for the international news wire service UPI in San Francisco, Kouns became a successful industrial photographer. On the side, he practiced what he called “social work photography,” offering his services for free to organizations and agencies that worked with people who were deaf and hard of hearing, people with disabilities and for the Salvation Army. 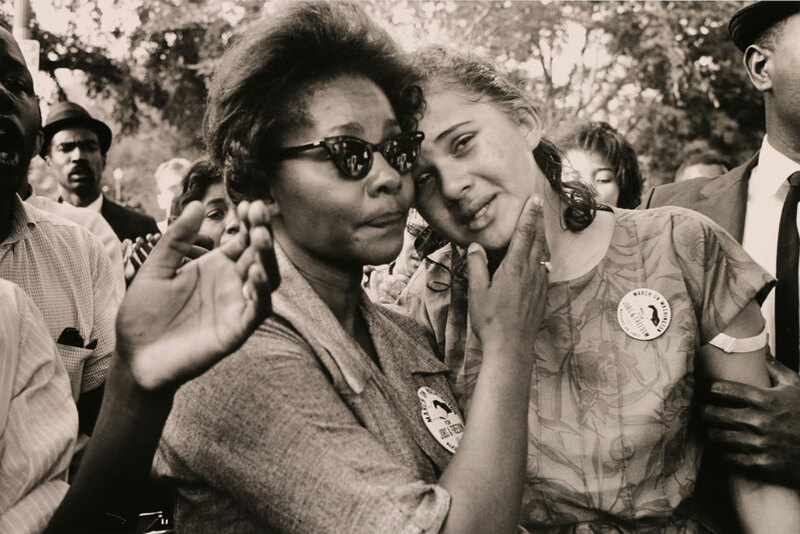 In 1963, Kouns traveled to the March on Washington, where he took photographs of its participants. Later, while in Birmingham, Ala., he documented the aftermath of the 16th Street Baptist Church bombing that killed four girls. From 1963-65 he traveled to Selma, Ala., to photograph the struggle for civil rights, including two marches from Selma to Montgomery. Kouns later traveled to California’s San Joaquín Valley to document the Agricultural Workers Organizing Committee’s efforts to unionize farmworkers. 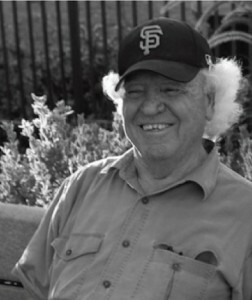 He ended up staying with the workers and continued to follow the unionizing efforts of Filipino and Mexican-American farmworkers during the 1960s and 1970s. 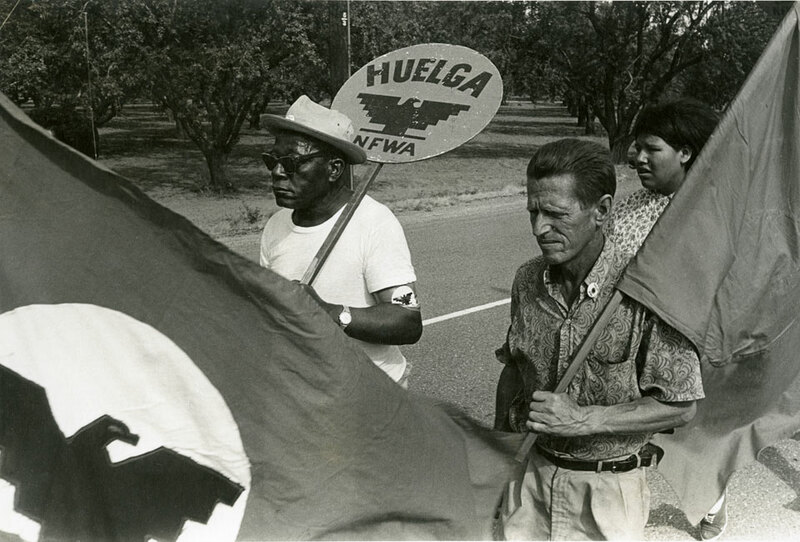 The committee merged with the National Farm Workers Association to become the United Farm Workers of America. The mission of CSUN’s Tom & Ethel Bradley Center, housed in the Mike Curb College of Arts, Media, and Communications, is to collect, preserve and disseminate the visual history of Southern California, with an emphasis on ethnic minority communities and photographers. Oral histories, manuscripts and other ephemeral materials support the photograph collection. The center was established in 1981 by Kirkton as the Center for Photojournalism and Visual History. It was renamed in 2008 the Institute for Arts & Media, as its mission and participation broadened. After entering in a partnership with the Tom & Ethel Bradley Foundation in 2013, it was renamed again as the Tom & Ethel Bradley Center. The center holds about 1 million images. Many of the images were produced by African-American freelance and independent photographers in the African-American communities in and near Los Angeles. Other noteworthy collections held by the center include images by the late freelance photographer Richard Cross, who documented the Colombian descendants of the first free-slave community in the Americas, Palenque de San Basilio, as well as the wars in El Salvador and Honduras for Newsweek, the Associated Press, The New York Times and U.S. News & World Report; Emmon Clarke, a volunteer photographer for César Chávez and the United Farm Workers during the formative years of the union; and photographer Herb Carleton, who spent his career at the Los Angeles Daily News, starting at the newspaper when it was known as the Valley News and Green Sheet. For more information about CSUN’s Tom & Ethel Bradley Center, visit its website at http://www.csun.edu/bradley-center/ or call (818) 677-3037.